Today’s the best day of the year! Happy Master’s, everybody! 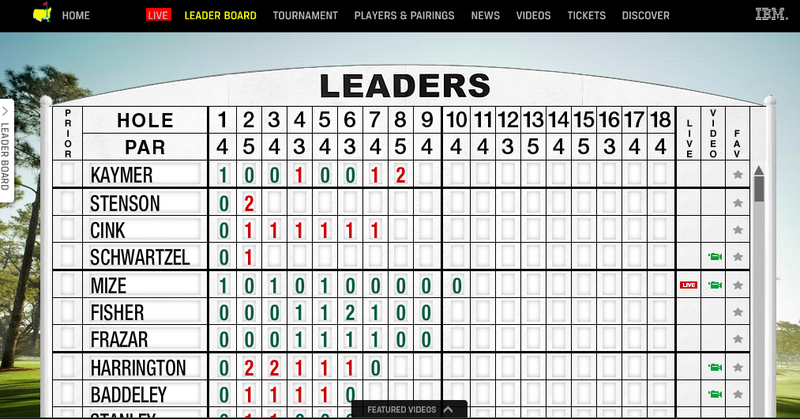 The Master's leaderboard on the Masters.com Website during this morning's opening round in Augusta. I’ve had the TV blasting from the moment I woke up this morning, and I’ve minimized my conference call schedule to make sure I can pay appropriate attention to day one of the 2012 Masters’ tournament from Augusta, Georgia. As of this writing, Martin Kaymer has jumped out to −2 after 9, while Henrik Stenson is −2 but through 3. The course seems to be playing difficult so far, with very few red numbers thus far. Tiger Woods just played #1 and is at even par. The big question overnight was whether Augusta would allow for lift, clean and place (where the golfer can pick up their ball and clean off any mud, grass, etc. ), but apparently it wasn’t necessary, despite the 14 inches of rain the course saw overnight on Tuesday. Now, to your viewing options: This year, I’m keeping tuned into the Masters iPad application that IBM helped build for the tournament. It includes a nice top-shelf interface that includes a leaderboard, livestreaming video from both featured groups and Amen Corner, and a news stream that keeps you in touch with the latest from the round. It’s a VERY nice one stop Master’s shop. I’m also tuning into the Golf Channel for ongoing commentary for highlights, and soon, I’ll be tuning into the AT&T U-Verse Master’s coverage, which will allow me to custom follow one of two featured groups, Amen Corner, and/or 15/16. Nice job, AT&T! You should promote that more! And of course, on Masters.com, you can find everything you need to know about the tournament, including all the pairings, results, and live video coverage of Amen Corner, 15/16, and of course, pictures from today’s round. You can also follow the hashtag #masters on Twitter, but be forewarned — it’s trending like #egypt during the Arab spring, and this is only day one!